A view of the southeast corner of Sxith and Kansas Avenue in Topeka, Kansas, taken from Radges Topeka Directory. 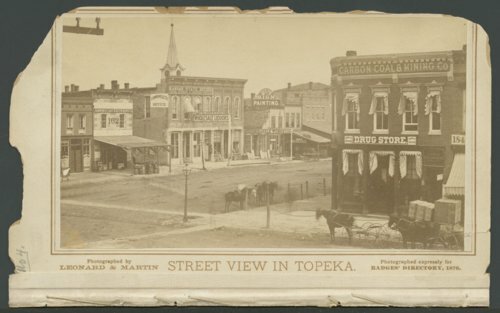 Businesses visible in the photograph are: American Express Co., Commonwealth Office, Kansas State Record, C.R. John's & Co., Marble Works, and Carbon Coal & Mining Co. Horses and wagons are also visible in this photograph.